When cooked at home with a ready-made bone broth, traditional chicken tortilla soup can be an easy, delicious, and nutritious alternative to this favorite recipe from Mexican restaurants. The secret is lots of fresh lime and crispy baked tortillas. That’s what makes this one of those healthy recipes that will keep you satisfied. 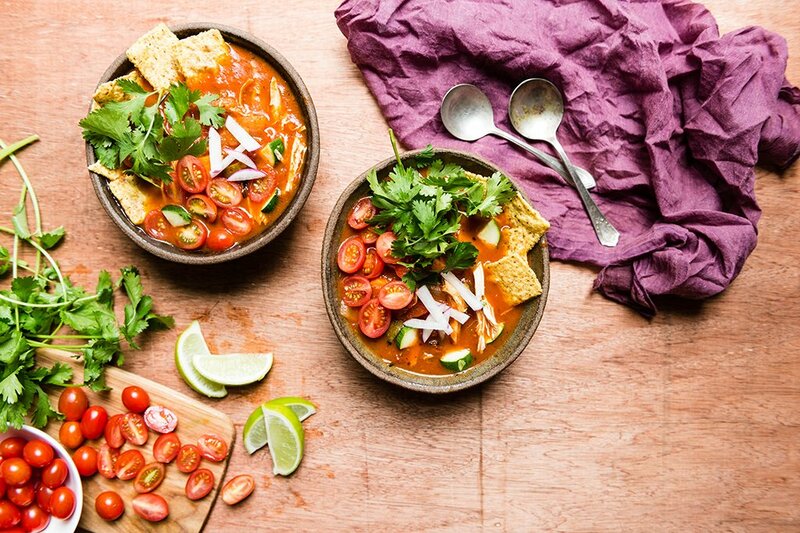 With the addition of beta carotene-rich sweet potatoes and zucchini, this tortilla soup recipe packs in more nutrient-dense veggies than the original, which typically calls for frozen corn and black beans. It also calls for freshly baked corn tortillas cut into strips, rather than tortilla chips, which are typically fried in refined oils. Instead of making a flavorful chicken broth from scratch, we simplified this recipe by using Kettle & Fire’s Chicken Bone Broth, which is flavor- and protein-packed. You can make your life easier by getting the shredded chicken from about one whole boneless skinless chicken breast or four boneless chicken thighs. But the easiest thing is to use the meat from a rotisserie chicken or whole chicken in the crock pot or slow cooker. The toppings are another great way to add flavor and nutrients to this soup. Fresh cilantro, fresh cherry tomatoes, and crisp radishes are all great options and add a bit of green. If you need something a little creamy to cut the heat, we suggest using greek yogurt instead of sour cream. When cooked at home with a ready-made bone broth, traditional healthy chicken tortilla soup can be an easy, delicious, and nutritious alternative to this favorite recipe from Mexican restaurants. The secret is lots of fresh lime and crispy baked tortillas. Heat the oven to 375°F. Place the tortilla strips on a baking sheet and transfer to the oven. Cook until crispy and brown, 8 to 10 minutes. Meanwhile, In a large pot over medium-high heat, warm oil. Add the onion and garlic and cook until the onion is soft, 4 to 6 minutes. Add the sweet potato, oregano, cumin and chili powder and cook until fragrant, about 1 minute. Then add the tomatoes and broth. Cook, partially covered, until the flavors start to meld, 10 to 12 minutes. Add the zucchini and chicken and cook until the zucchini is soft, 10 to 12 minutes. Add salt to taste. Remove from the heat and stir in as much lime juice as you’d like. Place the tortilla strips in bowls. Pour the soup over and add as many toppings as you’d like.